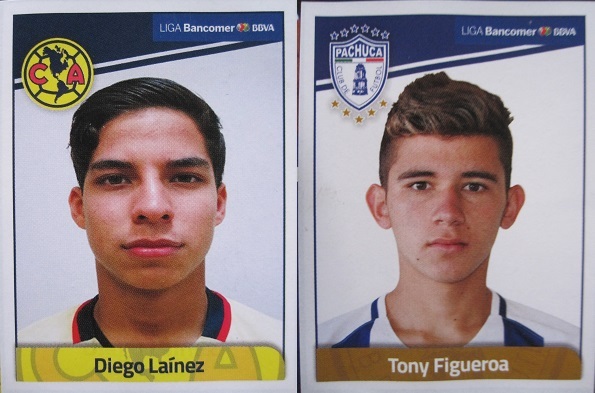 With Liga Bancomer 2017/18 the Panini series of the Mexican league continues uninterrupted since 2013/14, keeping the blue theme of the cover. Before the edition 2013/14, other five albums were published (1997, 2007, 2009, 2010, 2011). Unfortunately the latest collection shows an impoverishment of this series. The stickers of the mascots and the club badges have disappeared and the general quality of the album (for example the paper) has dropped. The only positive new feature of this collection are the stadium stickers, which show the beautiful and glorious stadiums of Mexico. The album starts with the calendar of the season, the foreword, and three shining stickers: the official ball, the trophy of the Liga and the trophy of the Ascenso league. The clubs of Liga Bancomer are shown in alphabetical order (starting from the Aguilas of América) including 17 stickers each: the stadium, the team photo (two stickers), and 14 players. After the Liga clubs, there is the section "GoLALAzo", with 12 shining stickers of the best goleador of the league. The clubs of the Ascenso league are also included, but with only two stickers each (team photo), missing the sticker of the club badge.